BizkaikoTxakolina (Txakoli of Biscay) held last april 5th at the Café Antzokia of Bilbao its Bizkaiko Txakoilnaren Eguna (Txakoli Day), an annual event which serves as the official launch of the latest vintage of the txakoli of Biscay. The event was attended by the Mayor of Bilbao, Juan Mari Aburto, the Chairman of the General Councils Ana Otadui, the Deputy Councillor for Economic Development, Trade and Employment, Xabier Otxandiano, Txema Pérez and Jose Ramón Taranco, from Laboral Kutxa and the ambassadors of Bizkaiko Txakolina (Txakoli of Biscay), Marta Acilur and Julio Alegría, as well as winemakers, producers and guests who attended the Café Antzokia. The event was the setting for the farewell of the Chairman, Iñaki Aretxabaleta, and that of the current Regulatory Council, at the end of its statutory mandate. Aretxabaleta recalled in his speech the difficulties that Bizkaiko Txakolina (Txakoli of Biscay) had to overcome during these recent years of economic crisis, and thanked the collaboration of all those who make up the AOC and took stock of his management, in which he highlighted the work undertaken by the Council to ensure the authenticity of the product. In this regard, he emphasized the collaboration of Bizkaiko Txakolina (Txakoli of Biscay) with HAZI to establish new control procedures to ensure the origin of the grape, and the training of the new Tasting Committee and the renewal of the scoring procedure. Peli Manterola, Quality and Food Industries Director, highlighted the quality of Bizkaiko Txakolina(Txakoli of Biscay), which he stressed that in recent years the product is seen as a gourmet category or high-end product. He recalled the tools which the Basque Government has available for the promotion, marketing and export of the txakoli, as well as to develop new innovative projects in the sector. Finally, Elena Unzueta, Member of the Provincial Council for Sustainability and Natural Environment finished the round of speeches. She highlighted the close collaboration that her department maintains with the sector and stressed that she will continue to support initiatives intended at enhancing the value of the txakoli of Biscay. Unzueta recalled the research work being carried out at the Zalla fruit growing station, as well as the direct economic aid which the Provincial Council earmarks to Bizkaiko Txakolina (Txakoli of Biscay). “We will continue working side by side with the sector, we will continue to support its development and providing contributions in order for BizkaikoTxakolina (Txakoli of Biscay) to seek new horizons, for the purposes of improving its quality and to open up the wine to new markets,” she said. After the speeches, the new ambassadors of Bizkaiko Txakolina (Txakoli of Biscay) were named: the feminine division of Athletic Club Bilbao women’s football team and the urban artist Eva Mena. Athletic Club Bilbao was represented by its players Eli Ibarra, Vanesa Gimbert and Erika Vázquez. Eva Mena, painted graffiti live on the stage itself. Three sommeliers, one from each Historical Territory, were responsible for uncorking and describing the Bizkaiko Txakolina (Txakoli of Biscay) of the 2016 vintage. Jon Andoni Rementería, from the Remenetxe restaurant of Muxika, who served as master of ceremonies with the help of Maria Herrero, from the Saikin 2 restaurant in Tolosa and Alvaro Tobalina, from the Andere restaurant in Gasteiz. 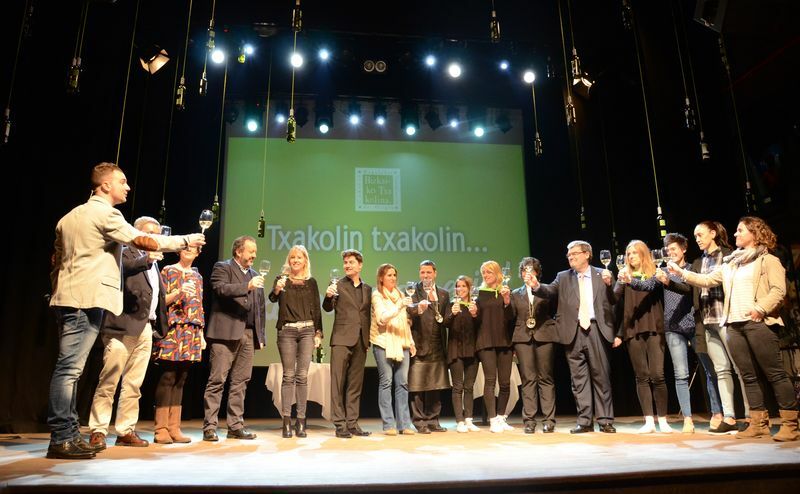 In the opinion of these experts, the 2016 Bizkaiko Txakolina (Txakoli of Biscay) is an bright, elegant and clean wine, with fruity and herbaceous aromas and a pleasant acidity, characteristic of its personality. The toast of all attendees, and a musical note, which also kicked off the event, put an end to that event.